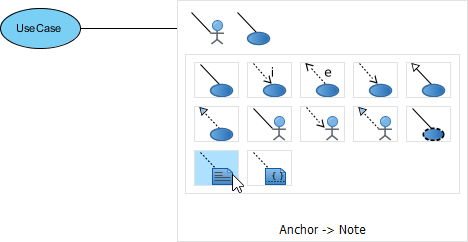 In Visual Paradigm, UML notes can be created and attached to a shape via an anchor connector. The premier advantage of using UML notes is to annotate a specific model element on the diagram with normal text or HTML text or to define OCL. Move the mouse over a shape. Release the mouse button at the position where you want to create the note shape. Select Anchor -> Note from Resource Catalog. The note is created and is is connected with the shape. Double click the note to start editing its content. Note that the toolbar above the note can be used to format its content. Drag the bottom right corner of note to resize it. Click on the diagram background to confirm editing the note.